Although we do not have a photo of BoWendy that does her justice, we are happy to feature one of her most exceptional foals, the very talented Godot SSF, her super star UB-40 son. We had the good fortune to buy BoWendy as a two-year-old from our good friend, Loucky Hagens, when she was transitioning her breeding program back to Holland. The Wendy mareline, from the van Helvoirt family, is famous for producing many approved stallions, national champion mares, top-selling auction foals, and top sport horses. It is one of the most sought after dressage breeding lines in the KWPN studbook. While carrying BoWendy, her dam contracted a virus that left her blind in one eye, so she can never be presented for studbook approval. Normally, we do not retain mares for our breeding program that are not predicated; however, we have made an exception for BoWendy. She is the best mover of all our mares. She is powerful, supple, and uber expressive. Her first colt for us, Franco SSF, by UB-40, is an absolutely outrageous mover. 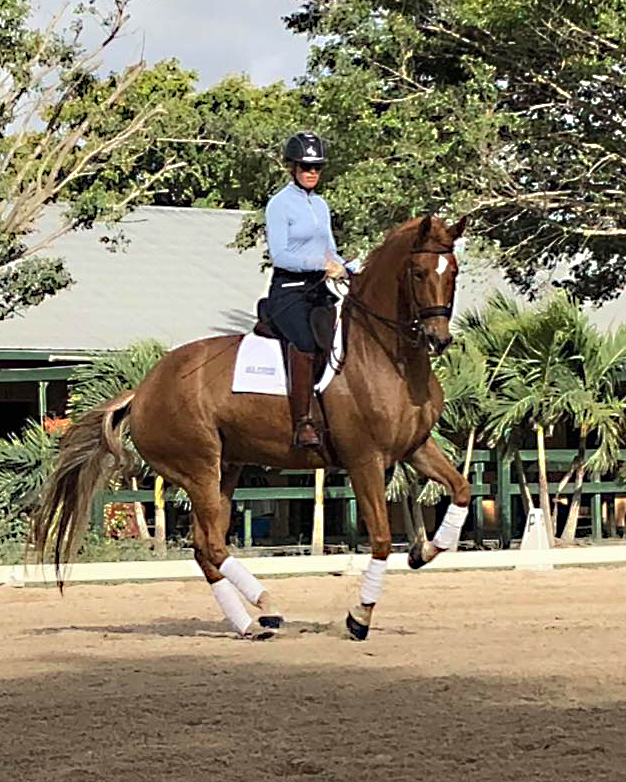 “Jimmy” was purchased by Kim Scudder as her next up-and-coming dressage project. Kim, in turn, sold him to a young event rider and she and Jimmy have just won their first event. BoWendy’s second colt, Godot SSF (pictured above) is an even better mover than his mother. “Sammy” was #1 gelding in North America as a three year old, with the highest score for movement of any adult horse on the continent. He is currently in training with Canadian Grand Prix rider Eiren Crawford and scoring really well in the Developing PSG classes in Florida. Sammy is an international quality horse with a huge future. BoWendy had a third UB-40 son, Ionesco SSF, another incredible mover. “Frenchy” is the pride and joy of our good friend, Kate Bruning. Eiren Crawford is so in love with Sammy, she purchased BoWendy’s next colt for herself, Kanadian SSF (also by UB-40), foaled in 2015. Not to disappoint us too much, but BoWendy had yet another full brother in 2016, Legendary SSF, who was immediately purchased by dressage rider Jackie Cartesio. Convinced we were going to finally get a filly, I splurged and bought a dose of Totilas for BoWendy for her 2017 foal… another colt, but an outrageous one, Moves Like Jagger SSF. Jagger is now a Colorado resident, and part of the dressage plans of Lesya Ukrainchuk. We are hoping Foal Seven is the charm, and BoWendy is currently carrying a Governor filly.